Hiking Time: 1:23 Avg. Pace: 2.5 mi./hr. + I rated the trail Class 4+ because the rating system is a bit deceiving. The difficulty rating considers the total mileage of the trail. In this case, the trail is nearly level for the first mile and a half. The actual climb is 1,365 feet over 2 miles and it’s a difficult 13% grade. cloudy and overcast at 8:53 am. At times the fog was pretty thick. 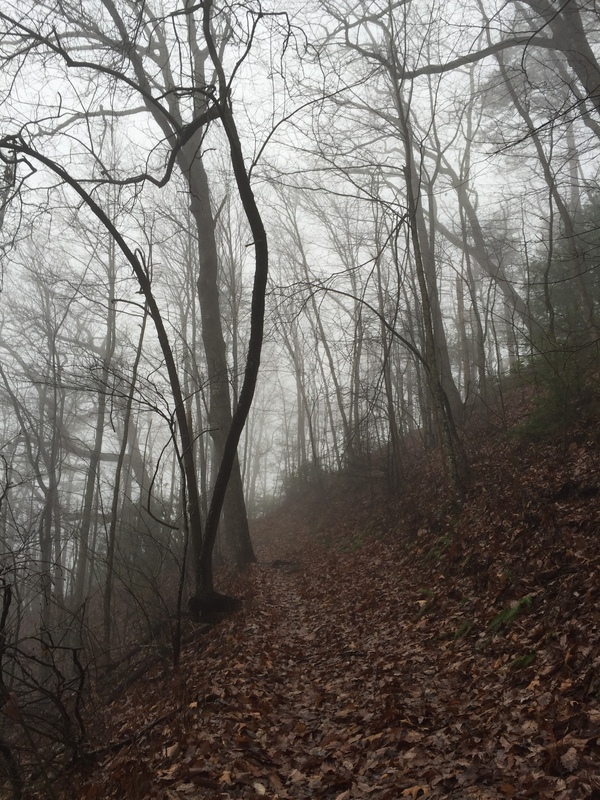 Hiking in the fog gets you wet without the rain. Overall, this is a very nice hike. On a clear day, there are views of the Cove as Rich Mountain Loop Trail gains elevation. There are two campsites on this loop and Crooked Arm Cascade is a nice feature. There are several small stream crossings but all are dry crossings with a little rock hopping. It was 10:16 when I got to Indian Grave Gap, covering the distance at 2.5 miles per hour. I had a decision to make. The trail goes west to its trailhead on Rich Mountain Rd. Skipping it would create an orphan hike but since today was a fairly low mileage day, I decided to grab it. I met a trio of ladies at the intersection and we exchanged greetings. They were hiking a fairly aggressive loop out of Ace Gap and were going to road walk Rich Mountain Road. I asked if they were 900 milers and they were somewhat undecided. They moved down Indian Grave Gap ahead of me while I had a drink of water and a snack. As I caught up with them, unfortunately, I gave them quite a start. Normally I am pretty good about announcing my presence when I come up behind hikers but I thought in the case, since our introduction was barely 20 minutes in the past, they would be expecting me. On the return, I met a man and his son. The father mentioned he had just started his first 900 miler so I gave him a few hints about information. 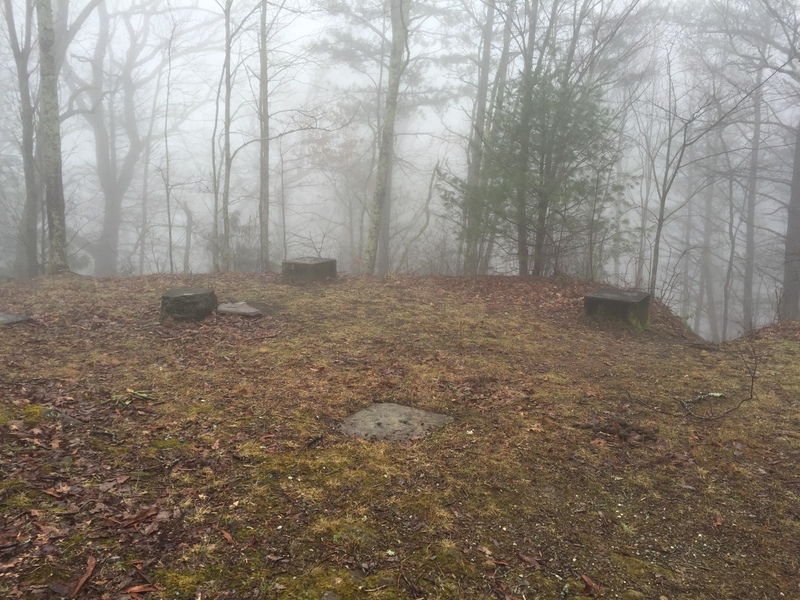 The weather remained foggy and cool on the steady climb up Indian Grave Gap. At about 1.8 miles, I passed a side trail with no sign. It led about 100 yds. up to a nob where there had been a lookout tower at one time. This would be a rather nice camping spot if not for the Park’s requirement to camp in established campsites. 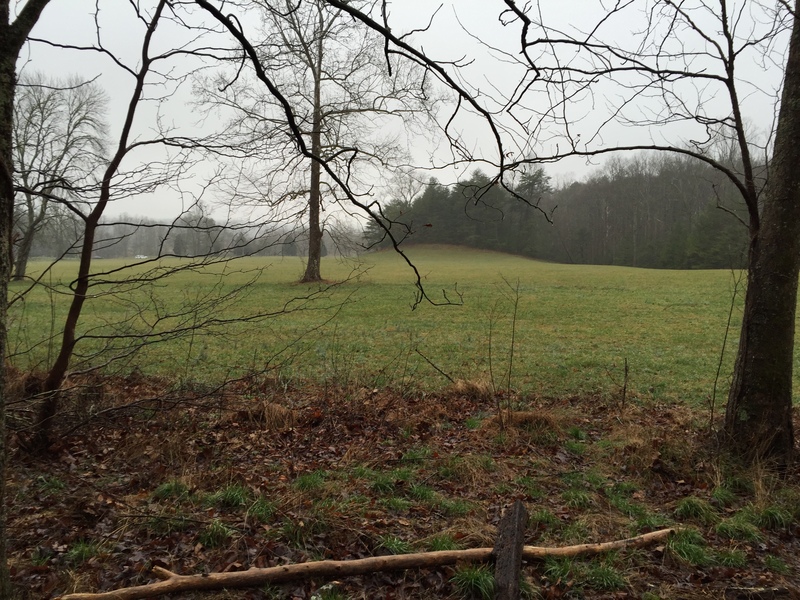 Along the ridge there are spectacular views of Cades Cove…when you can see them. At the Rich Mountain Trail, I decided skip past the 2.2 mile trail creating an orphan I will have to catch at a later time. 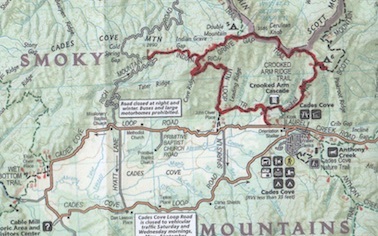 Continuing along, I came to the intersection with Scott Mountain Trail and Crooked Arm Ridge Trail. It was lunch time and Campsite 6 was just a couple hundred yards down Scott Mountain so I decided to break for lunch there. There was a sign from the Park Service on a tree at CS 6 stating that the Scott Mountain Trail was closed beyond all the way to School House Gap. A cool foggy atmosphere has it’s own charm in a way. CS 6 is a nice little campsite and the close mist, even though a bit melancholy, created a stillness for contemplation. I took along my copy of John Muir – Spiritual Writings edited by Tim Flinders. It’s a great little book that highlights Muir’s spiritual perspective, which is often overlooked by many of his biographers. Flinders pulls together a lot of passages from Muir’s letters and journals that underscore the fact that he considered wilderness to be sacred and the place where God is most likely to interact with us. Muir wrote of his time in Yosemite, “…I have spent every Sabbath for the last two months in the Spirit World.” I barely got into the introduction where Flinders gives us a brief biography of Muir in a spiritual context before chills from the damp weather required me to warm up again. Crooked Arm Ridge Trail was aptly named for its many switchbacks on a fairly short trail. toward the end, I was treated with the Crooked Arm Cascade. Then back to the Rich Mountain Loop Trail with a half mile hike back out to the trailhead. The trailhead leaves the Cades Cove Loop Road. near the main parking area at the gate. For the first mile and a half, the trail is very level and skirts a couple of the meadows off the Cove. At 1.4 miles, there is a pleasant surprise if you’re not expecting it. 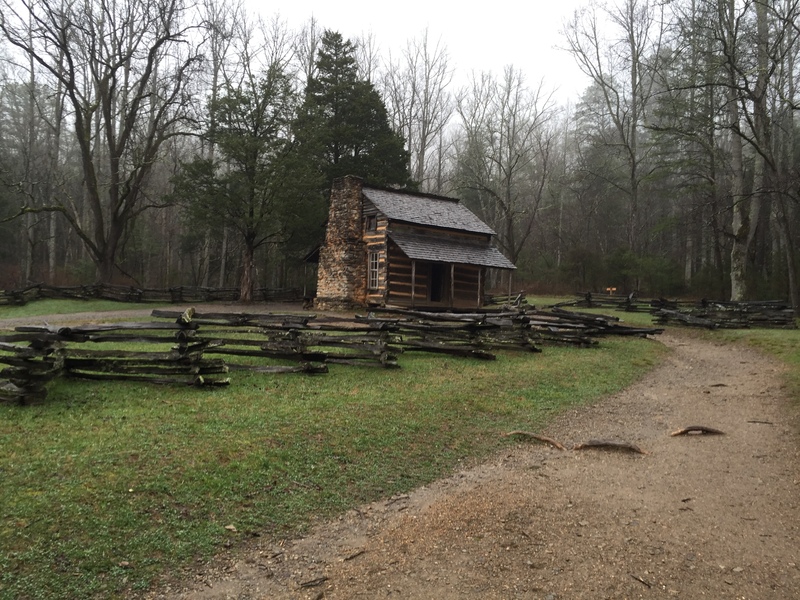 The trail passes the John Oliver Cabin, which is one of the many features of Cades Cove. Oliver was one of the first settlers of European descent in the Cove and the cabin is well preserved and maintained. At that point, the trail turns right and begins to climb steadily. All of the elevation gain (1,365) is over the next 2 miles or so making the climb a challenging 13% grade. The trails ends at 3.4 miles at the intersection with Indian Grave Gap Trail. 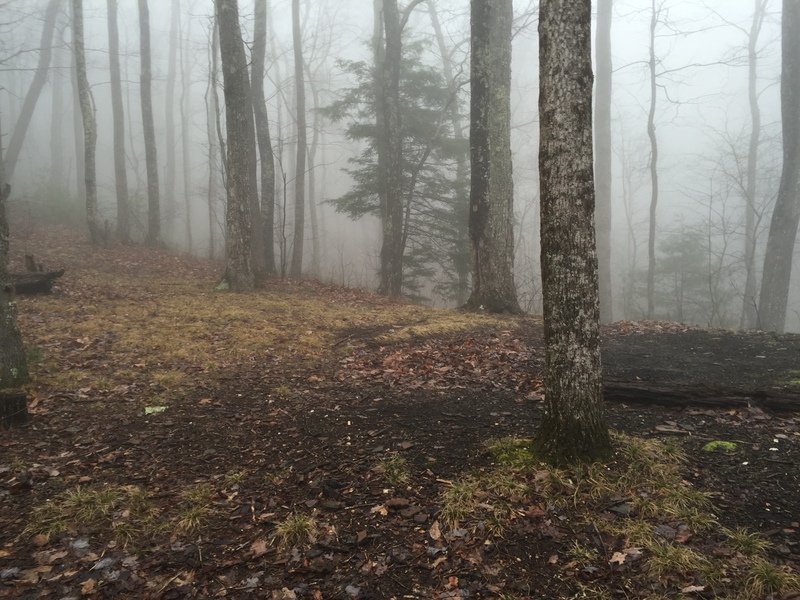 This entry was posted in Trail Log and tagged Cades Cove, John Muir, Rich Mountain Loop Trail on December 31, 2015 by blogginggazelle. We followed this trail out to the John Oliver cabin and a bit beyond last weekend. It’s a much nicer way to enjoy Cades’ Cove than following the cars and looking/waiting for a parking place! It’s an easy walk too! It starts to get a bit more steep right after the cabin but not bad.